Tower Transit should get rid of the whole First numbering system. IMO their fleet numbering is horrible. I see, well Metroline have a whole load of vehicles to do. Will probably make sense to pay staff extra to spend the night doing such a job! Well I imagine that making sure they are all legal and correct is an essential task. Metroline and Tower Transit will have plans and people in place to ensure that the necessary changes are done. As the changeover is on a Saturday there is the benefit of a slower build up in services giving more time to prep buses. There are also (generally) fewer buses in use on a Saturday than M-F. Removing fleetnames and changing vehicle IDs will take time. TfL will have quite a task on its hands too as it will need to change all its contract details, performance data, payments, I-Bus and various other systems too. It will be interesting to see what does happen to the batches of vehicle IDs that are used in I-Bus and how First's block of numbers is reallocated to Metroline and Tower Transit. There'll also be quite a task for Brian with the London Vehicle Finder as things change. 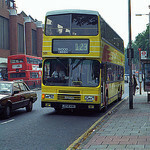 iBus has already been updated #HAYES(Metroline), also saw a 92 with GREENFORD(Metroline). TfL have still use East London instead of Stagecoach on the performance information on their website. That's because the company is still East London (and indeed Selkent). Stagecoach is just the owning brand. The same for London Central and London General, with Go-Ahead the owning brand. It is because they use two different operators licences, TfL split them into two so"East London Bus & Coach Co" and "South East London & Kent Bus Co LTD" the trading name is Stagecoach London . Arriva London is split as well into "Arriva London (North)" and "Arriva London (South)" due to the same thing. Stagecoach normally keep the original registered names unlike First or Arriva, but there are anomalies to that rule for the other two. When the company became ELBG, no legal lettering needed to be changed as they brought the legal name too, the only thing that changed was the trading names. Wondering if "Centrewest London Buses LTD" will transfer to Tower Transit. DN33789 SN13CGY has been delivered along with about 7-9 new E40D's intended for the route 425; DN33789 is sitting ready to go into the maintenance shed at Lea Interchange blinded with 58 Leyton, Grange Park Road. With White and Black Blinds. The bus is logoless. They also operate as Torrens Transit in Adelaide,South Australia.They are one of 3 major bus contractors here,and have been very succesful and run a very good operation. One of their key directors is Neil Smith who has a strong business and transport background. Transit Systems Australia has recently won contracts to operate bus services in several parts of Sydney,which they will start operating from early October. Are the decorations of the interior of the bus like the hand rails, seat patterns and flooring going to change or they are keeping it to the First Group interior? It's early days yet, but I would guess that any buses that may be due for refurbishment may get a new interior, depending on how quick the changes in specifications can be made (there could be outstanding orders already in process with the present interior). The new Enviro 400's for the 425, which are sitting at LI as 'TA1' observed, are expected to be in First interior so it could be up to 7 years before everything thats related to First disappears. The same thing happened with 56 reg Enviro 400's for the 61 - they were ordered by Stagecoach before they sold out to ELBG so had Selkent fleet names but with Stagecoach interior. Same thing happened with the 273 and its Enviro 200's which started a new contract at the same time as the 61. The 61 & 273 Contracts did not begin at the same time. So there will be no changes to any interiors. But are the new buses for Tower Transit going to be the same with First Group colour scheme? It's Early days. We have to wait until Tower Transit refurbish a bus or purchase THEIR OWN vehicles.